Home Digitized Dumbo takes flight! Dumbo is the little elephant with giant ears that the world fell in love with. The whimsical story of a flying baby elephant melted hearts when it hit the big screen in 1941, and has been a family favourite ever since. After several decades, a whole new generation of children is set to fall in love with the tiny elephant with the big ears with Disney’s live-action remake of Dumbo. And thanks to an array of technical wizardry, the computer- animated Dumbo looks just as real as his human co-stars and is set to break your heart. The original 1941 Dumbo has always been one of the sadder Disney stories. The baby elephant with gigantic ears gets ridiculed almost immediately after being born, and gets separated from his mother when she tries to protect him. However, the 2019 live-action remake from director Tim Burton makes the story even darker, focusing on a human cast struggling with tragedy too. The animals were the main characters in the 1941 version, but in this movie the spotlight is on the humans. The circus that Dumbo and his mother are part of is run by Max Medici (Danny DeVito), a smooth talker who seems to take genuine pleasure in his traveling community of freaks, clowns, and performers. Holt Farrier used to perform as a daring horse rider in a pair with his wife. But he went off to fight in the Great War, and in the interim, his wife passed away, leaving behind two young children: the budding scientist Milly played by Nico Parker, the 14-year-old daughter of British actress Thandie Newton and director Oliver Parker, makes her acting debut playing the role and Finley Hobbins plays her brother, Joe. Farrier returns without an arm, and with a demotion; now, Medici tells him, he’ll be in charge of the elephants. It soon turns out that Baby Jumbo, aka Dumbo — whom everyone makes fun of for his massive ears — can fly. News spreads, and the whole little circus gets turned on its head when the entertainment mogul V.A. Vandemere and his lady, the “Queen of the heavens” (and, as it turns out, trapeze artist) Colette (Eva Green) show up to buy out Medici’s circus. Medici becomes a vice president in Vandemere’s operation, and the whole operation moves up to his massive Disney World-doppelganger park in Coney Island. That’s when things get dark. The drive to accumulate money, when it takes over the drive to make great art or entertainment, kills creativity and crowds out humanity and decency. Turning simple joy and wonder into pure eye-popping extravaganza can only end in emptiness, in people losing their jobs and being trapped in avarice. This makes the movie bleak in contrast to 1941 version. The two children are left to process their mother’s death while their father was away, and the whole family needs to find a new role to make ends meet. The ringmaster Max Medici wants the family to get to work immediately upon their reunion, and start taking care of the circus elephants. As life on movie seems dark Dumbo enters the picture pretty quickly, and unlike the original movie where it takes a while for the elephant to fly through the air in public, this little baby gets to soar quickly after he is torn away from mother elephant Mrs. Jumbo. That talent, the kids hope, could be the key to reuniting Dumbo with his mom. 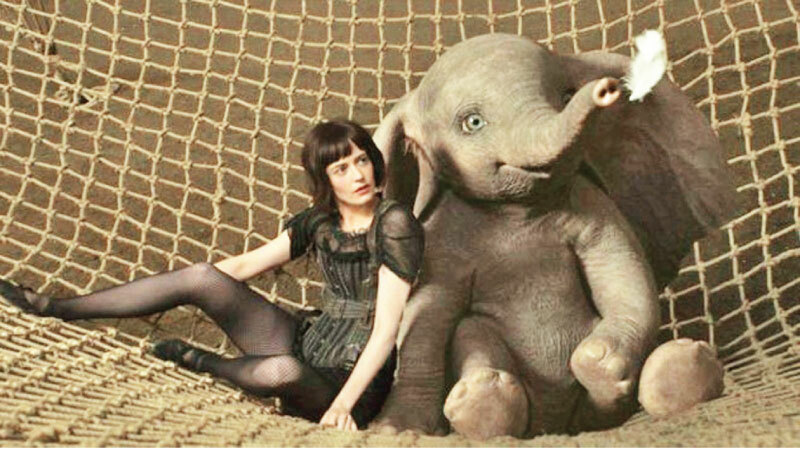 Like Disney’s 2016 remake of The Jungle Book, the computer-generated animals in Dumbo are hyper-realistic, but have been given human expressions. 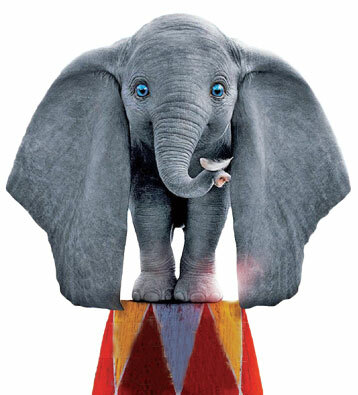 With his large, liquid, blue-green eyes, the adorable Dumbo brings the audiences to tears. Dumbo himself impressively fits the aesthetic of the real-world environments he’s placed in. 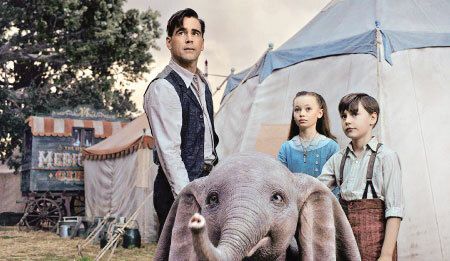 The elephant doesn’t speak and doesn’t have talking Timothy either like in the 1941 movie, but Milly and Joe fill in that role as the baby’s friends. The story has a happy ending with baby elephant being united with its mother and set free to the wilds. The circus family at the end uses only their creativity to entertain the crowd. Thus the question of whether it is right to exploit animals is also answered in a way that will appeal to modern sensibilities.